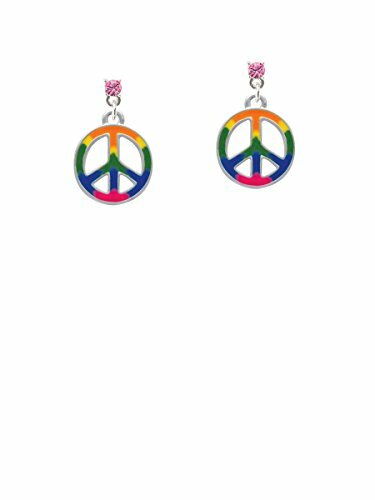 Give peace a chance when your little girl wears our classic and iconic peace sign earrings. 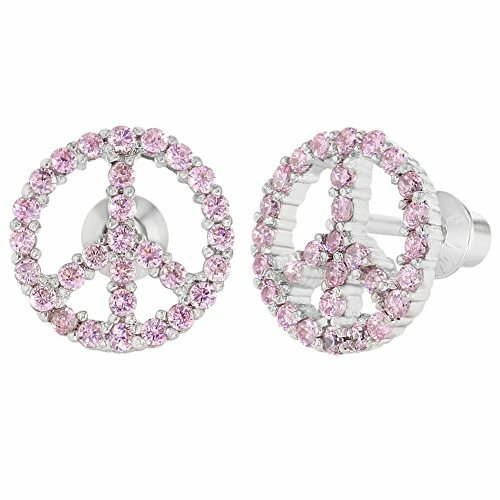 These screw back earrings for children are made of rhodium plated brass and adorned with sparkling pink crystal stones. 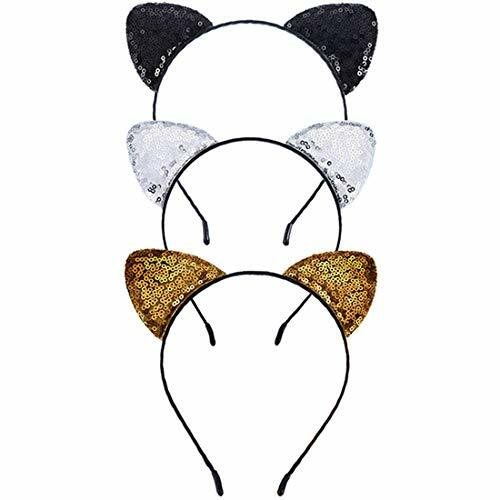 They make a sensational choice for girls and teens who have pierced ears. Screw on backs are the safest earring backings ensuring you comfort and security. 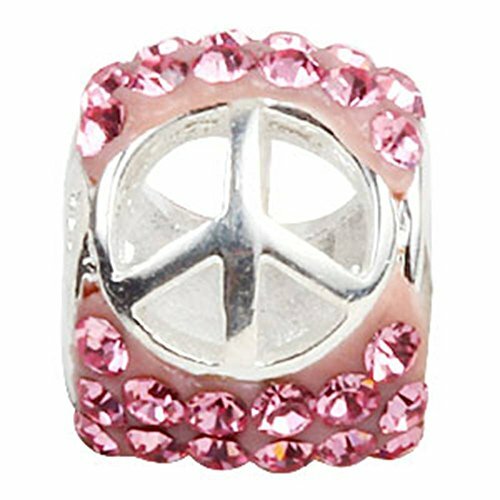 Silvertone Large Rainbow Colored Peace Sign - Pink Crystal Clip on Earrings. Silvertone Charm. Charm size is approx. 0.74 x 0.63 x 0.07 inches (HxWxD) including loop. Silvertone 8mm Crystal Earrings are 10 x 10 mm (HxW). The hinged earwires have an adjustable screwback to customize your fit. These large sparkle earrings add bling to any outfit. PLEASE NOTE: Our products are lead safe, but are not intended for children 14 years and younger. 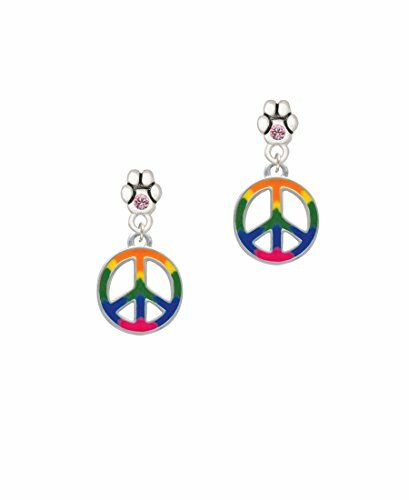 Silver Tone Large Rainbow Colored Peace Sign - Pink Crystal Paw Earrings. Silver Tone Charm. Charm size is approx. 0.74 x 0.63 x 0.07 inches (HxWxD) including loop. Paw Earring is approx. 0.34 x 0.30 x 0.08 inches (HxWxD) not including dangle. Earrings have steel posts. Earring crystal colors available: Red, Yellow, Green, Blue, Purple, Light Pink, Black, and Clear. Great for sports teams! Earring backs are Bullet ''Clutch'' Style with Plastic Pad. PLEASE NOTE: Our products are lead safe, but are not intended for children 14 years and younger. 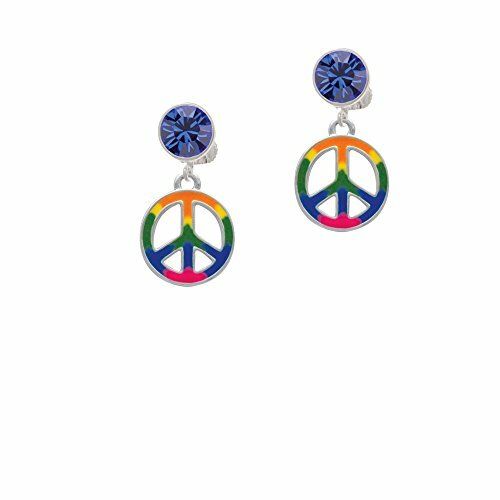 Silvertone Large Rainbow Colored Peace Sign - Blue Crystal Clip on Earrings. 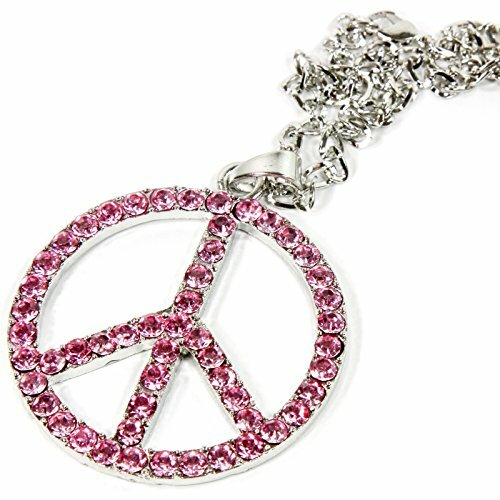 Silvertone Charm. Charm size is approx. 0.74 x 0.63 x 0.07 inches (HxWxD) including loop. Silvertone 8mm Crystal Earrings are 10 x 10 mm (HxW). The hinged earwires have an adjustable screwback to customize your fit. These large sparkle earrings add bling to any outfit. PLEASE NOTE: Our products are lead safe, but are not intended for children 14 years and younger. 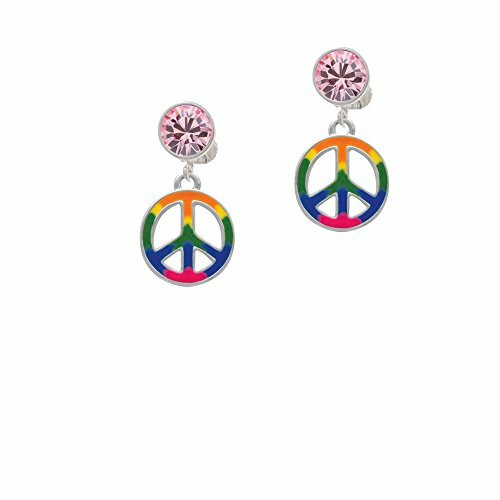 Silvertone Large Rainbow Colored Peace Sign Hot Pink Crystal Post Earrings. Silvertone Charm. Charm size is approx. 0.74 x 0.63 x 0.07 inches (HxWxD) including loop.3.3mm Crystal Earrings with steel posts. Earring backs are Bullet ''Clutch'' Style with Plastic Pad. Available crystal colors: Maroon, Red, Orange, Yellow, Lime Green, Green, Teal, Hot Blue, Blue, Purple, Light Purple, Light Pink, Hot Pink, Black, Clear, and Brown. Makes a great gift! 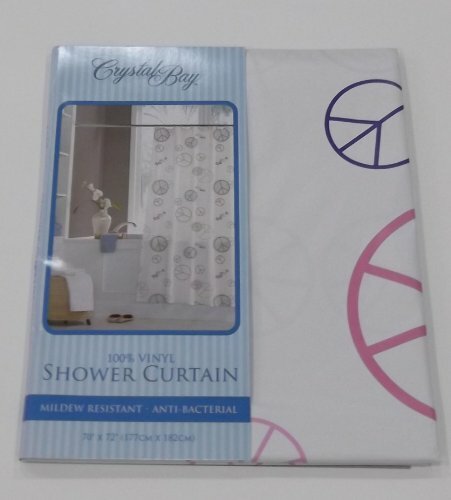 PLEASE NOTE: Our products are lead safe, but are not intended for children 14 years and younger.